The UN said Tuesday it had evacuated another 150 refugees from a Tripoli detention centre impacted by clashes, but said it had been unable to relocate others amid a rapid escalation in fighting. The UN refugee agency said it had evacuated the refugees, including women and children, from the Abu Selim detention centre in south Tripoli, to its Gathering and Departure Facility (GDF) in the centre of the capital. The refugees evacuated Tuesday were "petrified and traumatised" by the fighting and feared for their lives, UNHCR said. The UN agency stressed that the current conditions in Libya "underscore the fact that (the country) is a dangerous place for refugees and migrants." "Those rescued and intercepted at sea should not be returned there," UNHCR said, also reiterating its call for an end to the detention for refugees and migrants. 16, 2019 3:16 pmUNITED NATIONS (AP)  A proposed U.N. resolution demands that all parties in Libya immediately de-escalate the fighting and commit to a cease-fire. The Security Council is divided over Hifter's offensive. A proposed press statement soon after the offensive began that urged the Libyan National Army to halt the offensive was blocked by Russia, one of the permanent council members. U.N. spokesman Stephane Dujarric said Secretary-General Antonio Guterres "would welcome a strong and united response from the Security Council." 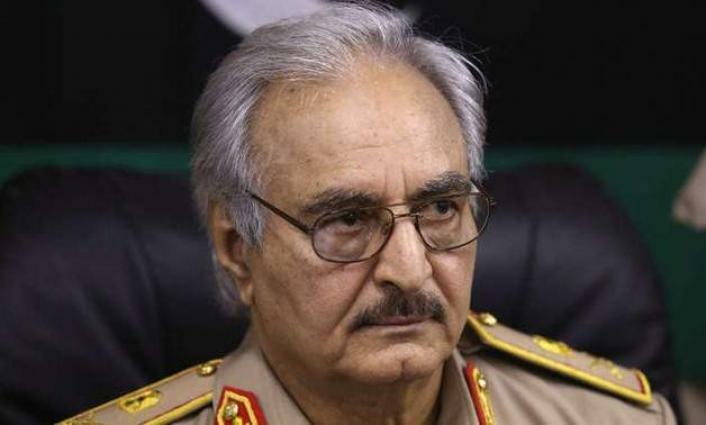 The U.N. chief was in Tripoli promoting a national conference of all Libyan parties when Hifter announced the offensive. The UK has drafted a resolution at the UN Security Council and presented it to member states calling on all Libyan sides to cease their fire in Tripoli. Diplomatic sources said the UK resolution calls on all sides to cooperate with the UNSMIL and its Head Ghassan Salame to reach a ceasefire across Libya. The resolution can only pass if 9 out of 15 approve it, provided that none of the five permanent member states votes it. The UK ambassador at the UN Security Council told reporters on Monday that Britain hopes the resolution gets approved. 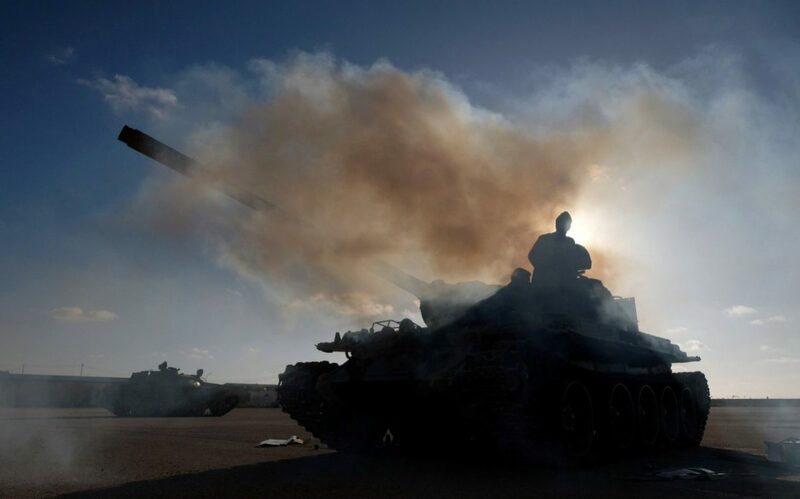 Clashes in southern Tripoli areas continue between Khalifa Haftar's forces and Libyan Army forces under the command of Presidential Council, with documented use of heavy weapons to target residential areas and public institutions by Haftar's forces. The Russian-Arab Cooperation Forum was held in Moscow earlier on Tuesday. He opined that the LNA's offensive operation against Tripoli might have been carried out in order to foil the new round of the intra-Libyan negotiations. Earlier in April, Haftar ordered an offensive to retake Tripoli from the GNA-backed forces. 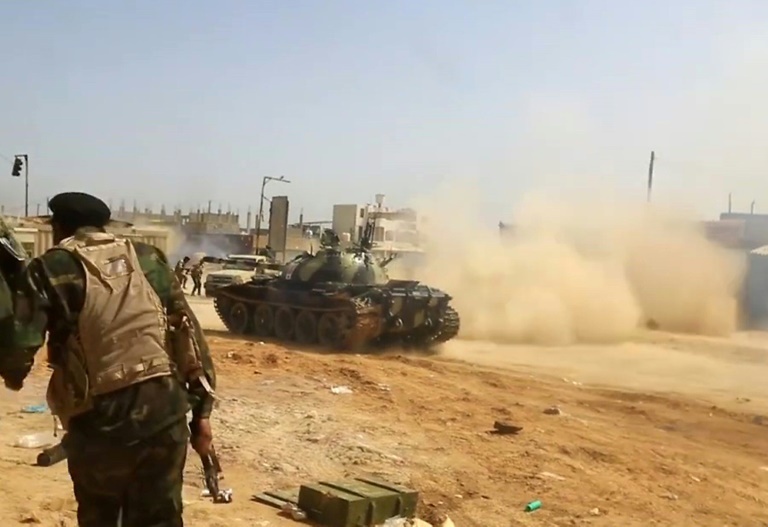 The LNA has already recaptured a number of settlements on its way to the capital, including the Tripoli International Airport, located around 20 miles away from the capital. The forces loyal to the GNA announced a counteroffensive, dubbed Volcano of Rage, to repel the National Army. R2P declares that states and governments not only have the right to sovereignty, but also a responsibility to protect their populations, and that the international community must take action when states fail to uphold this responsibility. They agreed, as well, that the international community should assist States in exercising that responsibility and in building their protection capacities. Key Foundational ColumnsR2P has three key foundational columns: ‘Responsibility to Prevent,’ a ‘Responsibility to React,’ and a ‘Responsibility to Rebuild.’ The ICISS document also declares that:Prevention is the single most important dimension of the responsibility to protect: prevention options should always be exhausted before intervention is contemplated, and more commitment and resources must be devoted to it. A Critical View on the Responsibility to Protect, from the Global Policy Forum, 2014). A nation is defined by its ‘responsibility to protect’. British diplomats have circulated a draft resolution to members of the United Nations Security Council demanding a ceasefire in Libya. The move follows nearly two weeks of diplomatic deadlock over how to respond to violence that has seen at least 170 people killed and displaced more than 18,000 people. General Khalifa Haftar's self-styled Libyan National Army launched an assault on Tripoli, the seat of the country's UN-recognised Government of National Accord, on April 4, saying it wanted to clear out "terrorists" and unaccountable militiasBut LNA troops have become bogged down in fighting against forces loyal to prime minister Fayez al-Serraj's government in the city's southern outskirts, raising fears of a prolonged Syrian-style civil war. UNHCR has relocated 150 vulnerable refugees from the Ain Zara detention centre to the Gathering and Departure Facility in Tripoli, Libya. The Abu Selim detention centre is one of several in Libya that has been impacted by hostilities since clashes erupted in the capital almost a fortnight ago. Refugees at the centre told UNHCR that they were petrified and traumatised by the fighting, fearing for their lives. This relocation is the second UNHCR-organized transfer since the recent escalation of the conflict in Libya. After today’s relocation, there remain more than 2,700 refugees and migrants detained and trapped in areas where clashes are ongoing. The Prosecutor of the International Criminal Court, Fatou Bensouda, has expressed concern about the escalation of violence in Libya, saying her office is investigating new personal lawsuits in Libya. "I will not hesitate to expand my investigations and potential prosecutions to cover any new instances of crimes falling within the Court’s jurisdiction, with full respect for the principle of complementarity. No one should doubt my determination in this regard.” Bensouda said in a statement on Tuesday. "I urge all parties to the conflict not to commit any crimes within the Court’s jurisdiction, and in particular, for commanders to ensure that their subordinates do not do so.” She remarked. She reminded as well all commanders, military or civilian, who have effective control, authority and command over their forces that they themselves may be held criminally responsible for crimes committed by their subordinates. The U.N. Security Council is considering a British-drafted resolution that would demand a ceasefire in Libya and call on all countries with influence over the warring parties to ensure compliance. "The Secretary-General would welcome a strong and united response from the Security Council on this very issue," he said. The Security Council informally expressed concern on April 5, calling on all forces to de-escalate and halt military activity and specifically calling out the LNA. The draft U.N. Security Council resolution, seen by Reuters, expresses "grave concern at military activity in Libya near Tripoli, which began following the launching of a military offensive by the LNA ... and threatens the stability of Libya." 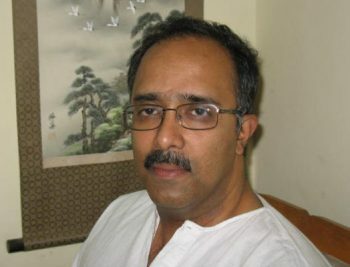 A resolution needs nine votes in favor and no vetoes by the United States, Britain, France, Russia or China - the so-called permanent five - to pass. Libya’s UN-backed Government of National Accord (GNA) appealed on Tuesday for Europe’s support against military strongman Khalifa Haftar, warning that continued violence could see 800,000 people try to flee to the West. Haftar’s forces are waging an offensive on Tripoli. 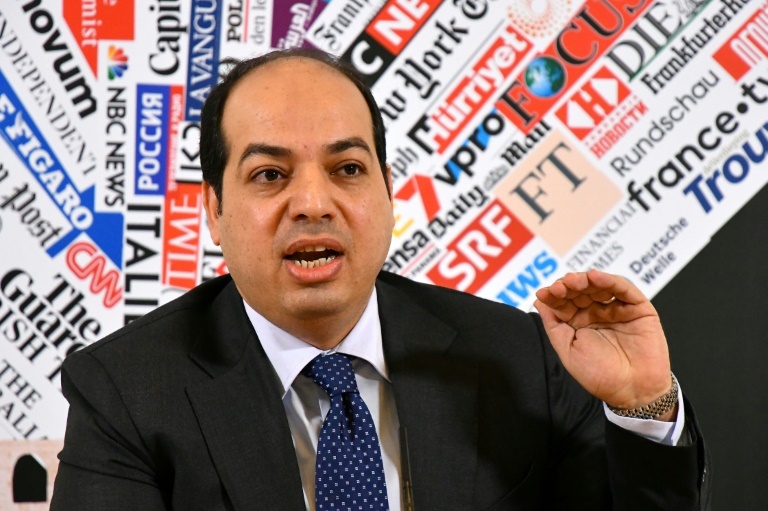 “It interests the whole of Europe to see a peaceful and democratic Libya,” GNA vice president Ahmad Maitig told the foreign media press association in Rome. He also said that Italy’s Interior Minister Matteo Salvini “shows big support for the peace process” and brushed off reports France favored Haftar, saying “the position of the French government is to support the national accord government,” according to AFP. Italy's far-right Interior Minister Matteo Salvini signed a new directive Tuesday against charity vessels rescuing migrants off Libya, targeting the Italian ship Mare Jonio in particular. 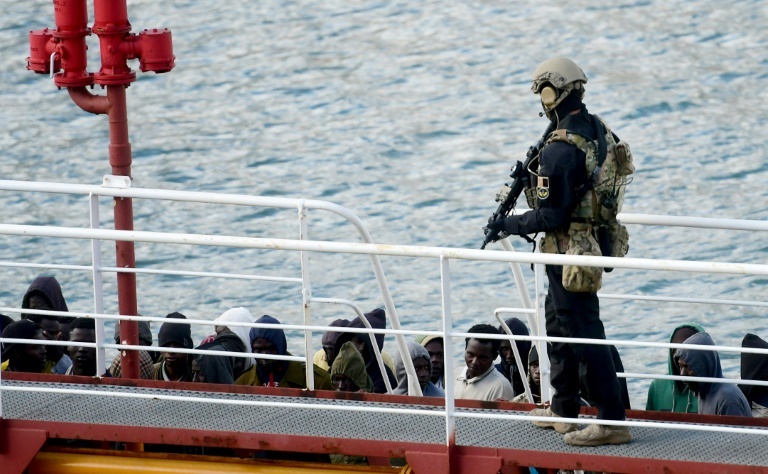 Salvini, head of the anti-immigrant League party, warned that the Mare Jonio and others must obey the orders of authorities in foreign search and rescue regions -- a reference to the Libyan coastguard. The Italian ship set off on its latest mission on Sunday and was headed to patrol the area off Libya on Tuesday. Mediterranea said an order to hand rescued migrants over to the Libyans would be "an incitement to commit a crime". The Mare Jonio rescued 49 migrants off the North African country in March after refusing to wait for a Libyan coastguard boat that was in the vicinity. Former Prime Minister Alfred Sant said today that Europe must ensure that Libya does not end up as a foyer for terrorism. The Maltese MEP, in an intervention at the European Parliament on the situation in Libya, said Europeans have the duty to demonstrate that their major interest in Libya is the welfare of the Libyan people. For Europe, what is essential should be that Libya does not end up as a foyer for terrorism." ADVERTISEMENTAlfred Sant said the Libyan people need stability. The Maltese MEP said we should "support all efforts undertaken in good faith to allow all forces in Libya that represent genuine interests to have voice. A British-drafted resolution presented to the UN Security Council demands an immediate ceasefire in Libya after forces loyal to warlord Khalifa Haftar launched an offensive on Tripoli, according to the text obtained by AFP on Tuesday. The council "demands that all parties in Libya immediately de-escalate the situation, commit to a ceasefire, and engage with the United Nations to ensure a full and comprehensive cessation of hostilities throughout Libya." Haftar backs a rival administration based in eastern Libya that is refusing to recognize the authority of the Tripoli government. The draft resolution calls on all sides in Libya "immediately to re-commit" to the UN dialogue and urges all member-states "to use their influence over the parties in Libya" to abide by the resolution. Diplomats have long complained that foreign powers backing rival sides in Libya threatened to turn the conflict into a proxy war. Libya's UN-backed Government of National Accord (GNA) appealed Tuesday for Europe's support against military strongman Khalifa Haftar, who is waging an offensive on Tripoli, warning continued violence could see 800,000 people try to flee to the West. Some "800,000 people can easily reach Europe," he said, adding that Islamic State group fighters currently held as prisoners could be among them. There were "more than 400 (IS) prisoners" in Libya whose whereabouts could not be secured should Haftar push on to take the capital, he said. At the same time we see some international partners, our international team players, supporting the attack and supporting Haftar. Libya has long been a major transit country for migrants desperate to reach Europe via the Mediterranean.